Day 3 of Australian Open continued and more seeds are crashed out but some buddies found their way out today! Cause I know That revenge is sweet! Stuart Bingham who lost to Ding Junhui in the Last 16 of World Championship this year, despite having led 12-9 up but eventually lost 12-13 made a sweet revenge today. Bingham failed to make his debut in the top 16 ranking at the end of the last season due to the defeat. Ding Junhui is defeated 2-5 although he made two centuries out of two frames he won, 104 and 124 in the match. 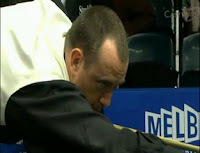 The Ballrun made 60 and 107 to be 4-1 up, followed by 86 to lock his victory in the final frame. Ding's team mate on World Cup, his buddy Liang Wenbo had a totally different experience in Australia. Liang beaten Matthew Stevens in decider, 5-4 though he missed 147 after scoring 15 reds and 15 blacks to end at 120. It was an exciting game for Stevens and Liang. Stevens knocked 63, 88 while Liang scored 120 (missed maximum), 111, 71, 51. Stevens believed Liang's win on World Cup has brought himself back with confidence. "Every time he got in he played well and took his chances.'' "Winning the World Cup has done him no harm. He had been struggling a bit but a win like that in Thailand has made him dangerous again.'' said Stevens. Liang Wenbo is facing Ken Doherty in the next round - who scored a 5-2 victory over Scotland's Stephen Maguire today. Ken strugguled in Thailand while he was playing for Ireland but he turned his disappointment to motivation. Matthew Selt who won over John Higgins yesterday, killed another Scotland's World Champion today. 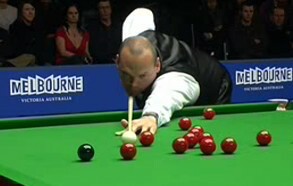 Selt completed a 5-1 easy win over Stephen Hendry. Selt will challenge another former World Champion Shaun Murphy on his road in QF. Mark Williams did not give satisfactory performance but still claimed a 5-2 win over Barry Pinches. The match lasted for four hours. "It was really tough and the way I played was just awful, appalling and I don't know why it was so bad," said Williams.